It's dark in here. The controller is a bit sweaty in my hands, though only from heat. I'm aware every time the door to the room opens and shuts. I'm aware the headphones are a bit overloud to compensate. I'm aware that I'm a bit hungry. I'm distinctly aware of not being afraid. I've spoken about this with people at length before: Horror games are an utter nightmare (get it?) to demo. For one, fear is an entirely subjective sensation—more than any other sensation I come in contact with as someone who writes about video games. Two, horror games are at their best when I'm sitting in a dark room at night, alone, with headphones on. In that very particular environment, horror games have a chance to scare me. I sat down to play The Evil Within, the latest survival horror game from Resident Evil creator Shinji Mikami, with trepidation. And I left with that same trepidation. I played two chapters of The Evil Within: Chapter Four and Chapter Eight. I don't know how far along in the story each of these sections were, though I'd guess four was about a third of the way in and eight was most of the way towards the end. The two sections took place in vastly different areas. In Chapter Four I guided protagonist detective Sebastian Castellanos through a creepy village and into an industrial basement area. In Chapter Eight the good detective and I marched our way through an old-timey mansion. I'm not even going to bother spending a lot of time on whether or not you'll be "scared" by The Evil Within because it's a fool's errand. I wasn't, and I don't think it's just because of the environment I was in (though I could be wrong). There are two primary paths to horror, which because I'm a journalist and not a scholar I'll just call "graphic overload" and "suspense." Graphic overload is something like the Saw series of films: You're supposed to be repulsed by the horrific imagery on-screen, creating unease. Suspense, on the other hand, is something like Ti West's House of the Devil—a slow, slow burn where the threat of something horrible causes more unease than the actual occurrence. Both can be good. The Evil Within leans towards the "graphic overload" end of the spectrum. I tend to not find this stuff scary. You might. Does the idea of a woman chasing you like a spider with eight human arms scare you? That's a good baseline here. Do you still have the capacity to be startled by lackadaisical jump scares? This game has some of those. Does a room filled to your waist with blood have you cringing with fright and nausea? This game has one of those too. 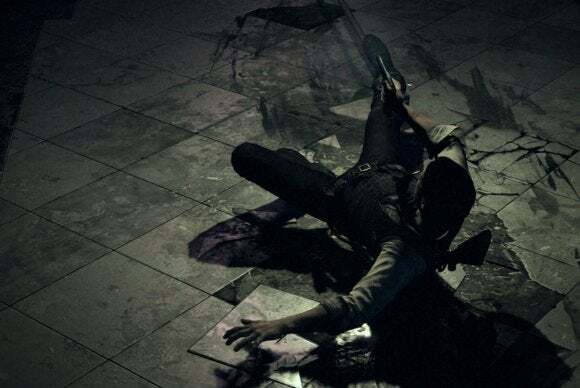 The Evil Within clearly aims to push boundaries of taste and what's "acceptable" in games. With every zombie (or whatever these are) you kill there's a chance it struggles back to life. To prevent that unfortunate occurrence, you have to light them on fire while they're down. And they scream. And it's really messed up. Cue the aforementioned room full of blood, or the spider-woman. Or that point where you use neurosurgery tools to probe at an exposed brain. The Evil Within tries to make you uncomfortable. Whether it works, well, that probably depends on your level of immersion in the worst of what the Internet and decades of horror films have to offer. Me? The best I got was a cringe. No real fright, though. More than anything, The Evil Within feels old-fashioned. It feels like Resident Evil 4. And at that revelation I expect some of you will cheer. And I expect some of you—a lot of you—will have fond recollections of Resident Evil 4. But go play Resident Evil 4 again. The game came out in 2005, and it plays like it came out in 2005. The Evil Within plays like it came out in 2005. Ready to traipse around the zombie-infested mansion so that a door with a locking-mechanism powered by three cylinders of blood will open? Ready to play as a main character who runs like an asthmatic grandfather? Ready for an insta-kill trap with no checkpoint ahead of it? Checkpoints are actually this game's most egregious sin, and one I hope is rectified prior to the game's release. If there's anything that makes a game certifiably not scary, it's having to play through the same content a second, third, fourth, or nth time. At the beginning of Chapter Four you're told to go inside a house and meet with your traveling companion's brother. Maybe he knows something. Surprise! The brother is insane and operating on a corpse. Also, there are other members of the living dead roaming around his house. The first time through this sequence I crept in, was a bit startled by the presence of a corpse behind one of the doors, fumbled with the controls, finally killed it, walked downstairs, watched the cutscene revealing the brother's madness, killed him, killed the third guy roaming the halls, walked outside, and promptly died. It took about ten minutes, all-told, and a number of those moments would seem like checkpoints. In reality, none of them were. I was booted all the way back to the beginning of the chapter. And then I died in the same spot two more times. By the fourth time through the content I practically sprinted into the brother's house like Rambo, shotgun brought to bear on anything that so much as grunted in my direction. It wasn't scary anymore—it was frustrating. I never thought I'd been babied by checkpoints, but maybe I have been. Regardless, it wasn't fun the second, third, and fourth time through. I just wanted to stop playing. The same thing happened later in the mansion, when I died in what was basically a quicktime event, only to lose thirty minutes of progress. At one point in The Evil Within a character says "The specific process to break down a human's psyche, to obliterate it and give myself free rein, is so obvious." So obvious, in fact, that I can tell you exactly what it is—forcing players to relive thirty minutes of content because you killed them off in what might as well have been a cutscene with a quicktime event. I don't know what to think of The Evil Within. It's hard to know, when you're demoing a horror game in a suboptimal environment, and even harder to know when it's an old-school survival horror game and you play two completely disjointed chapters with little-to-no tutorializing. When I get my hands on a retail copy and the experience is given the proper time to build, there's a good chance I feel completely differently. But after leaving my demo—two hours long, which is practically unheard of—I felt nothing but nervous. The Evil Within's old-school survival horror charms didn't draw me in nearly as much as I expected. Here's hoping I'll be in for a proper "I need to buy more underwear" experience when the game releases later this year.